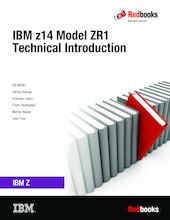 This IBM® Redbooks® publication introduces the latest member of the IBM Z platform, the IBM z14 Model ZR1 (Machine Type 3907). It includes information about the Z environment and how it helps integrate data and transactions more securely, and provides insight for faster and more accurate business decisions. This book explains how this system uses new innovations and traditional Z strengths to satisfy growing demand for cloud, analytics, and open source technologies. With the z14 ZR1 as the base, applications can run in a trusted, reliable, and secure environment that improves operations and lessens business risk.